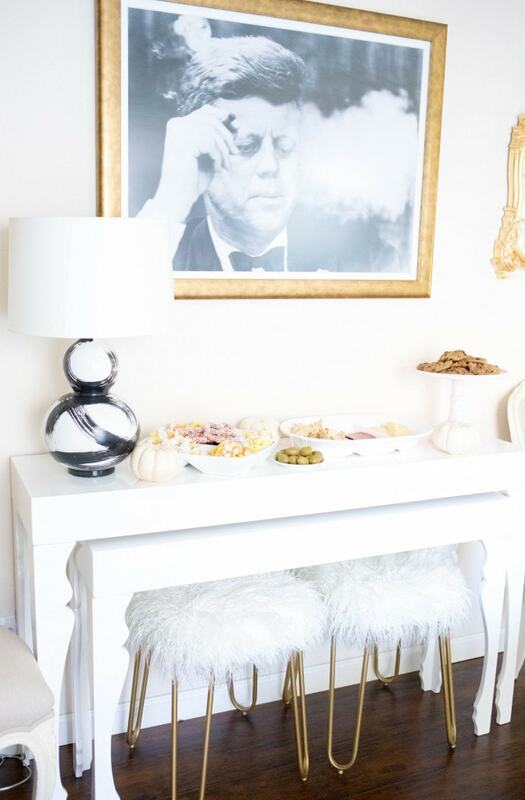 One of my favorite things to do with the start of a new season is mix up the bar cart! 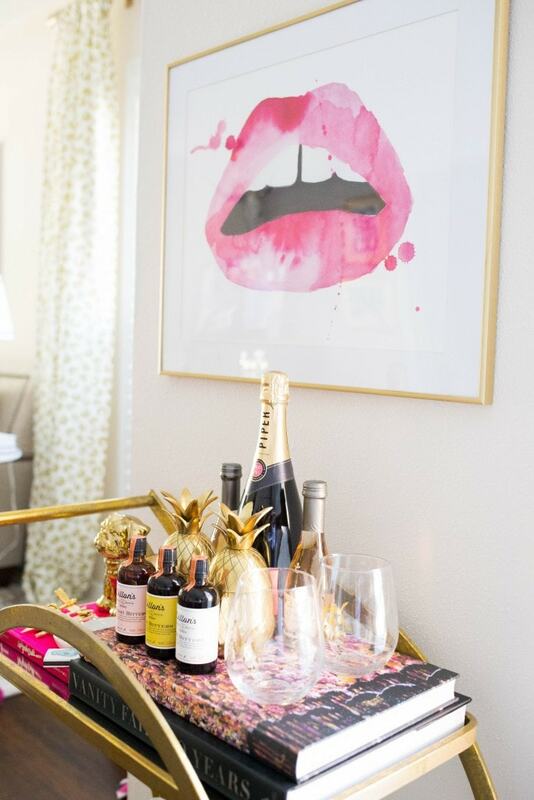 If you love to redecorate as much as I do a bar cart is your saving grace! Because who can honestly just keep redecorating a living room 24/7 for fun on a normal budget?! 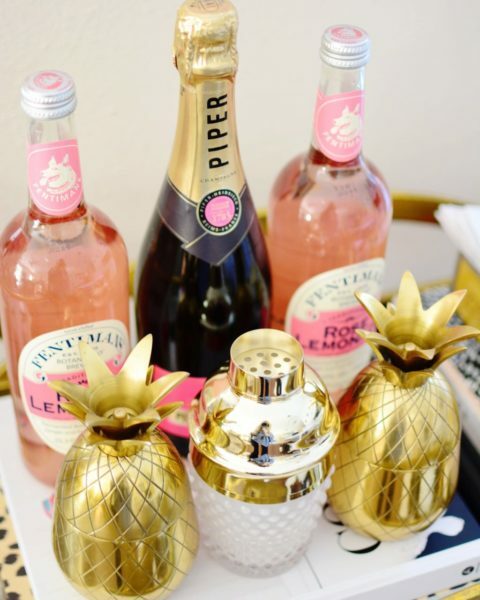 My bar cart is a way I can mix and match little pieces and feel fresh for the season while not going overboard! 😉 But do not worry if you aren’t a drinker, I don’t think bar carts should only be limited to alcohol. 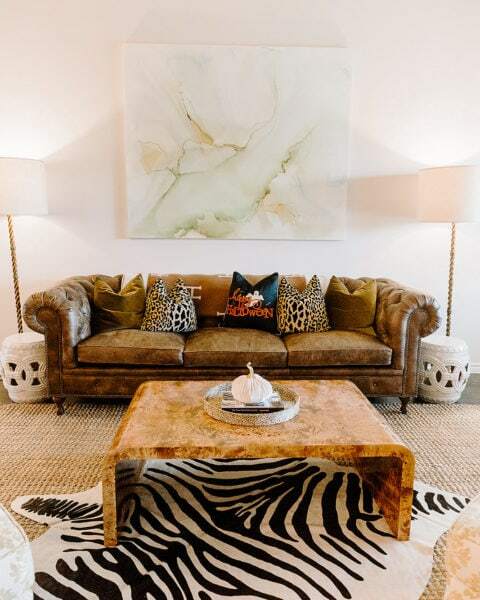 In fact, I think the best styled ones are the ones that have unexpected touches like candles, coffee table books and cheeky objects! 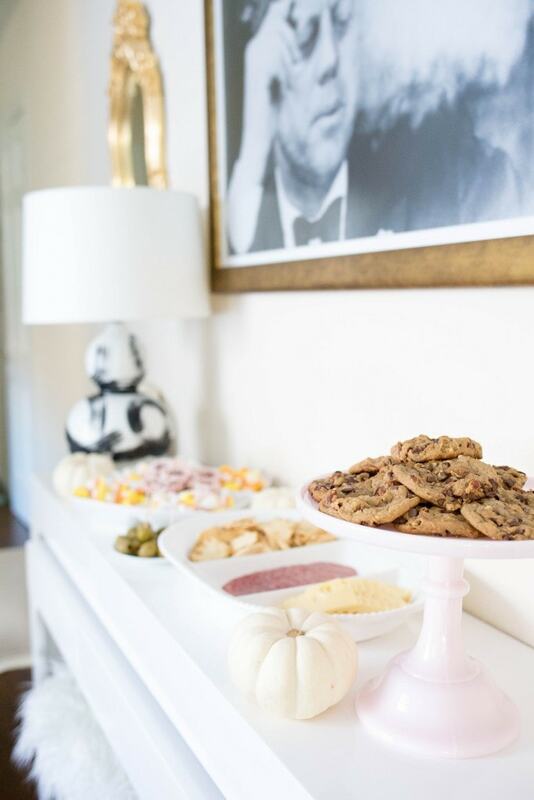 Today I partnered with Charming Charlie to share easy ways to mix up your home decor for fall as well as my favorite fall hosting recipe! 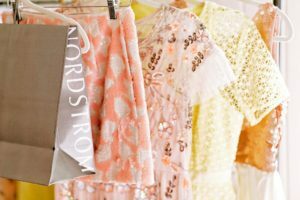 With this partnership COF readers get $10 OFF a $40 or more purchase in store and online! Just be sure to include: KM10 at checkout! Let’s talk hosting first! I’m a planner [um hello, this week I planned gifts for my Labor & Delivery Nurses and I’m not due to go into labor for 18 more weeks! haha] but half the time people come over when you least expect it. During the fall I like to keep three things in my kitchen that can be made to whip up something quickly! 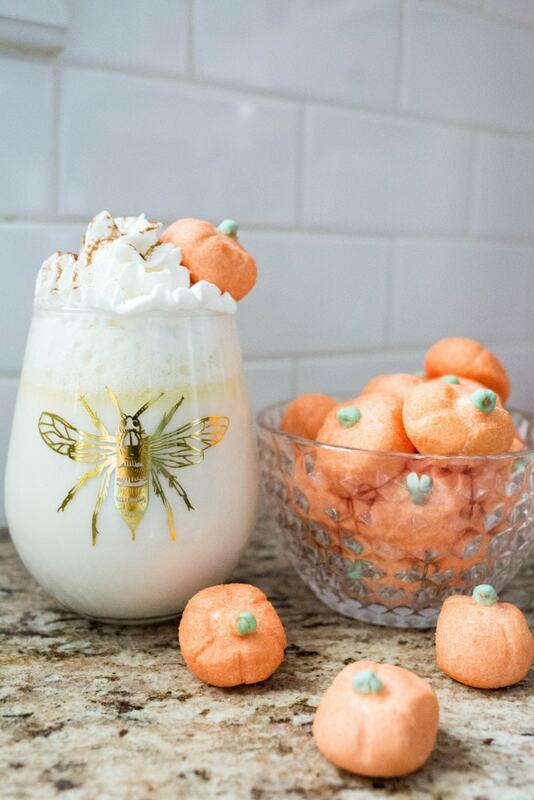 Pumpkin Spice White Hot Chocolate is not a new recipe by any means, but it is one I have used for years and it’s so easy to make. 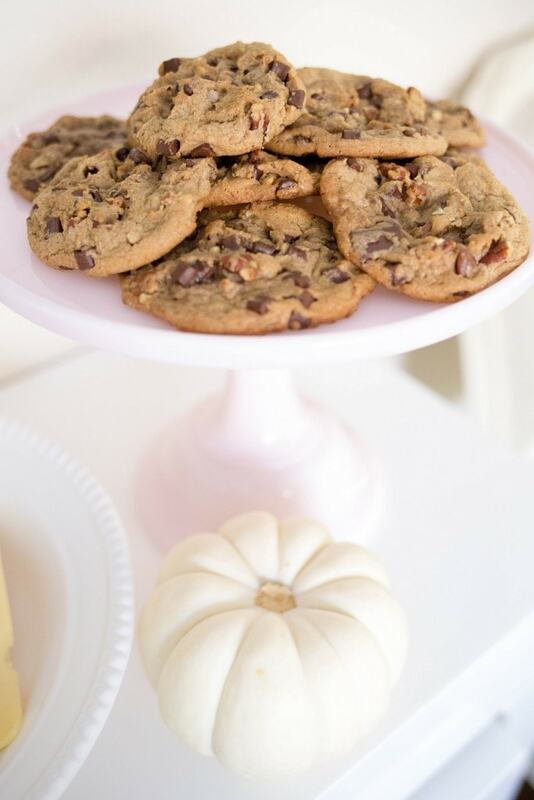 All you need is milk [I use organic 2%], pumpkin spice coffee creamer and white chocolate chips. If you know people are coming over about 2 hours ahead of time pop all three items in the crock pot on low and it will be ready in 2 hours. If people come over last minute this can easily be made on the stove. Melt your white chocolate chips, slowly stir in milk, allow to cool and add in creamer. Allow to cool before serving and top with whipped cream and marshmallows. I love little pumpkin ones you can find at supermarkets this time of year. To make it a little more festive [for those not drinking! 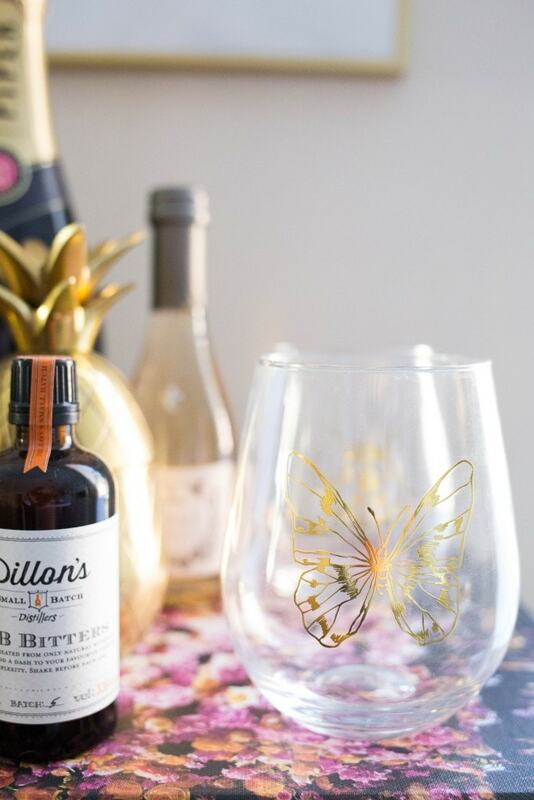 #pregnantgirloverhere] I put this in my Charming Charlie wine glasses. After being in the crock pot I allowed the drink to cool for 20 minutes and it was perfect in the glass while still being warm to drink. 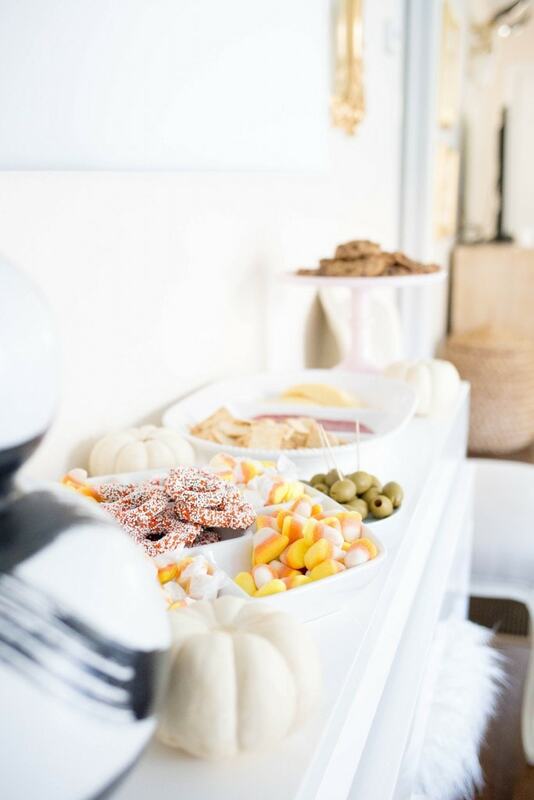 I also like to keep wine, cheese, crackers, olives, frozen cookie dough and fall candy in my kitchen because you can easily whip up a spread in under 20 minutes as featured on my console table. Cheese can last for awhile in your fridge as well as olives and frozen cookie dough, so I always grab those items at the store if I think there is a possibility people might come over. 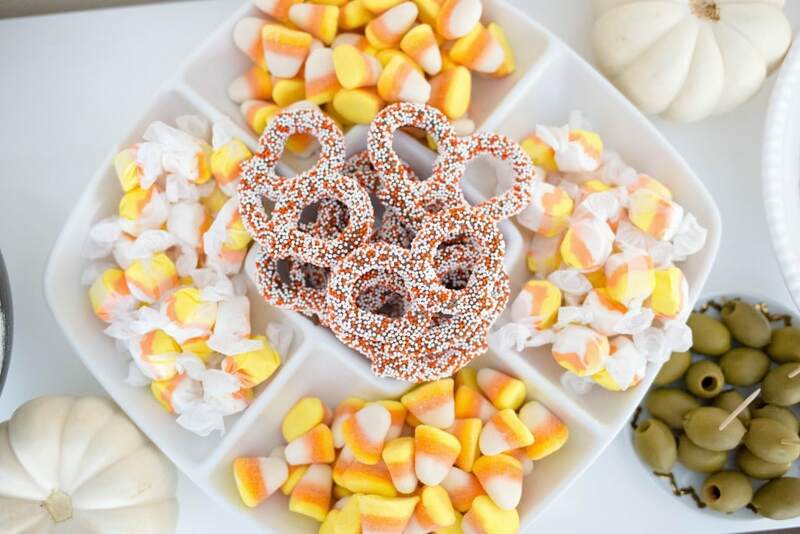 Between that and the pumpkin spice white hot chocolate it is plenty to munch on for a football game, girls’ night or evening with friends. 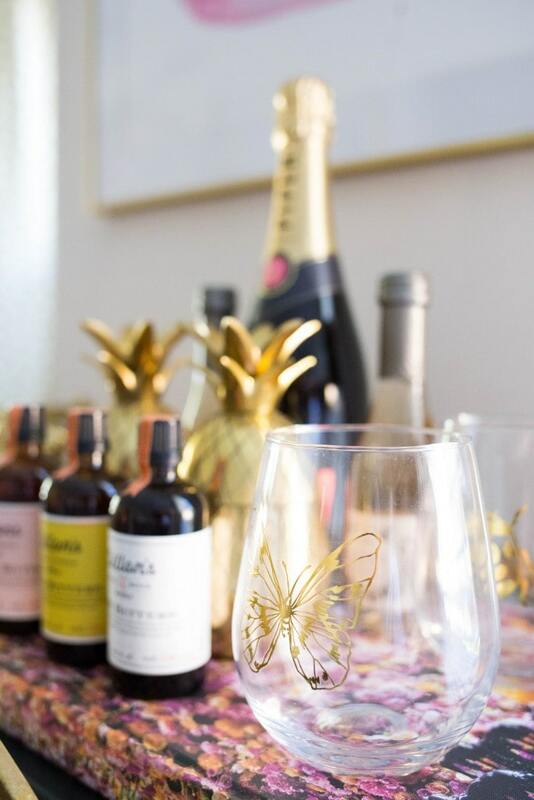 Now when it comes to decorating the bar cart, I wanted to add a few more items to showcase as opposed to just wine bottles! Because I’m pregnant and of course not drinking, I didn’t really see the need to fill it with cocktails we aren’t using. However, I always keep champagne on hand. Always. You never know when a girlfriend needs to be cheered up with a glass or celebrated with a bottle! 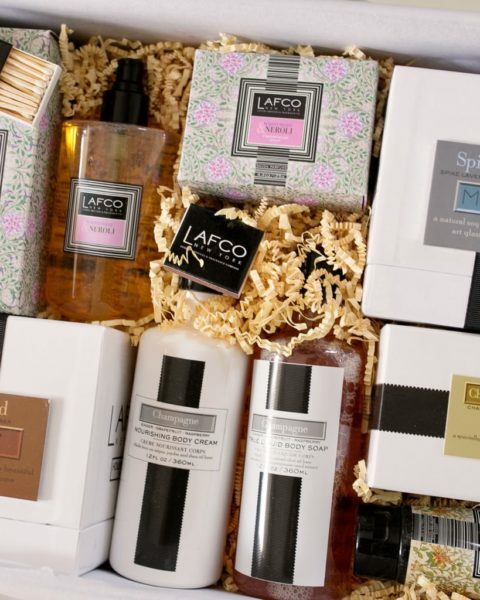 It’s the best trick to always having a gift on hand! So what do you do when you aren’t adding alcohol? You add dogs, of course. 😉 But in all seriousness, these little Charming Charlie bulldog and frenchie accents were so cute. Such a good gift for a friend for Christmas that loves dogs as she can keep this on her nightstand or desk at work. I’m actually going to add them to our little girl’s dresser once I style it because I have a feeling she will love cuddly dogs just as much as her mom! I also love to keep a candle and matches on a bar cart as another alcohol-free option. 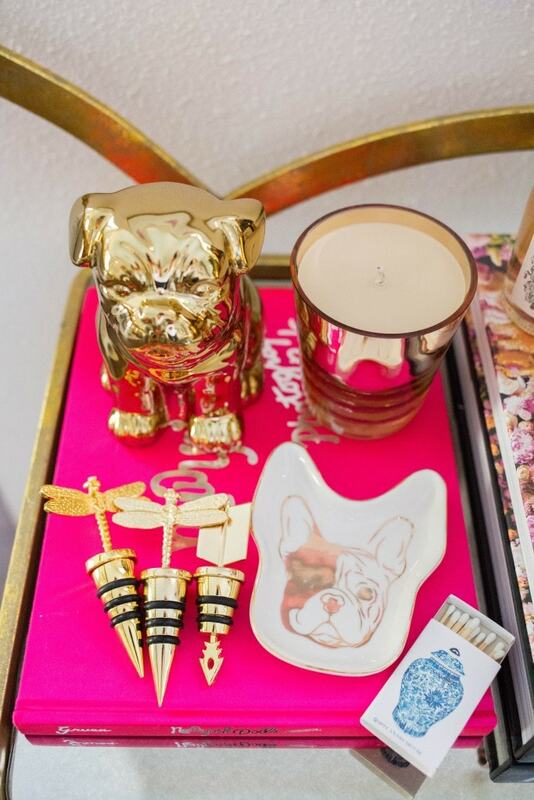 This french bulldog tray is perfect for jewelry on a nightstand, but I also loved it for my matches on my cart. I laid a few wine stoppers next to it and thought that little vignette was finished! My sweater and necklace are also CC! I get so many questions about this sweater on Snapchat [mostly because I wear it once a week! haha] and I love that it is only $35! It fits TTS. 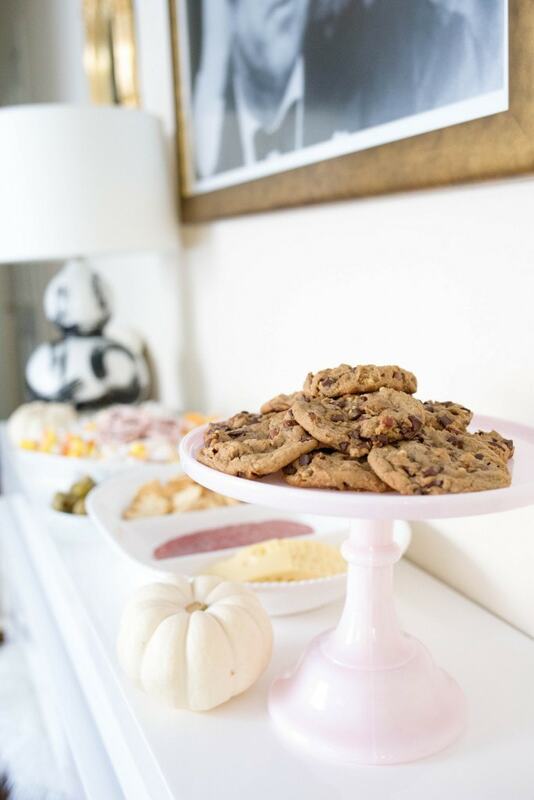 Do you have any favorite fall hosting recipes or ways that you update home decor under budget?! Thank you so much for reading! P.S. 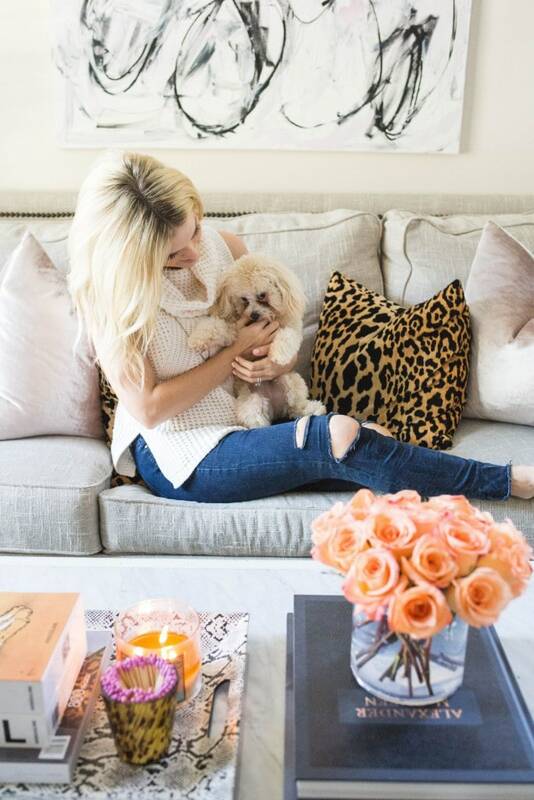 Not all of the items from my shoot are on the Charming Charlie site just yet, but they will be later today! As opposed to waiting to post this later today, I just wanted to share the promo code with you all in case you have a CC by you and wanted to stop by in the morning. 🙂 I’ll be adding the items in as they become live on the site! 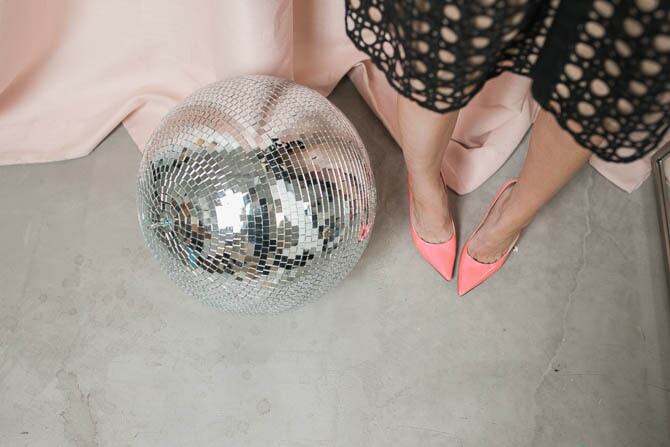 In partnership with Charming Charlie. All opinions are my own! AH! I have a little Frenchie named Remi so I need to go get that tray! So adorable! 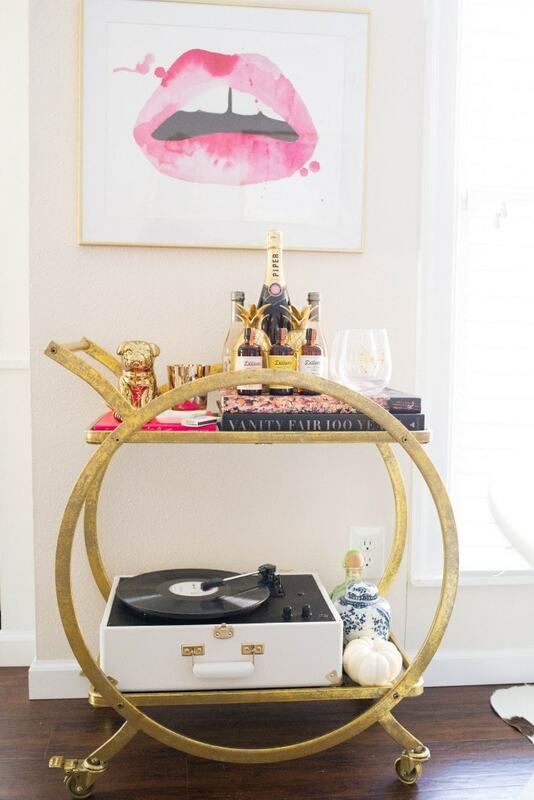 Thanks for sharing your fall bar cart! Love! 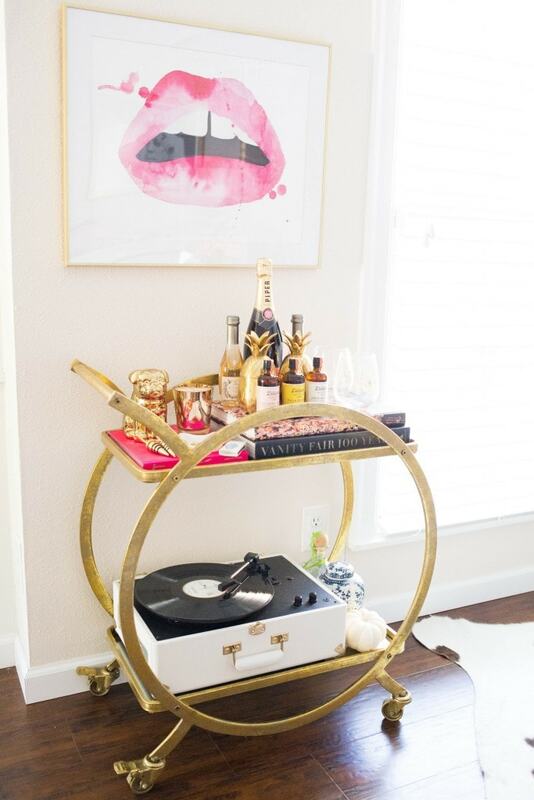 Where did you get your bar cart from? 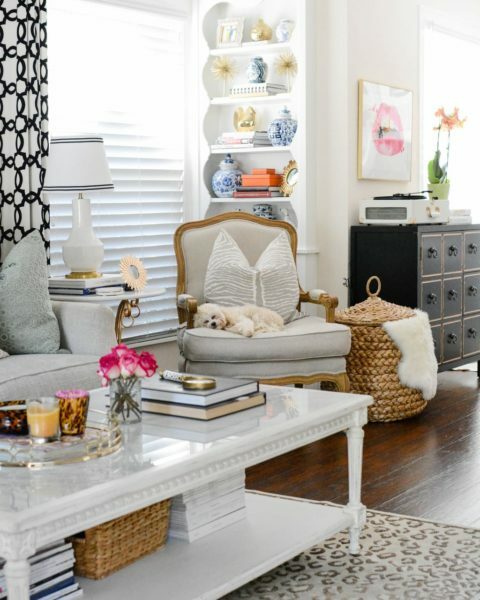 I need a new one for my living room and this one looks perfect! Love this post!! 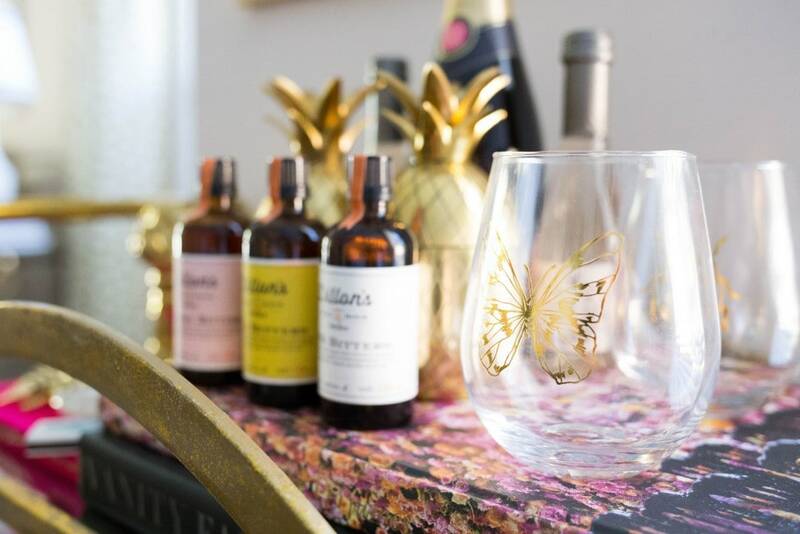 Your bar cart is perfect! 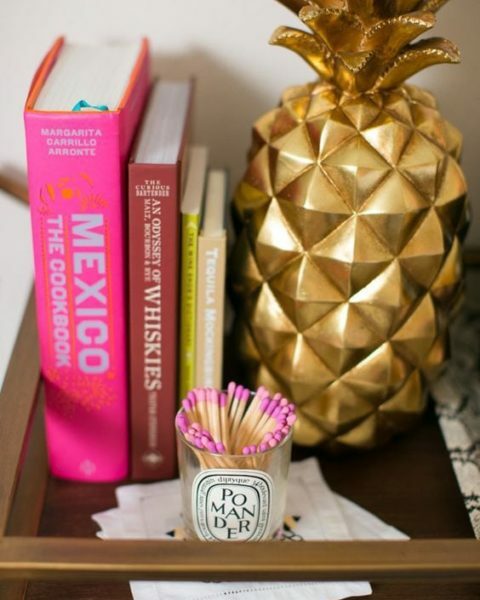 I love re- decorating my bar cart! That sweater looks too cute on you, I think I need it. 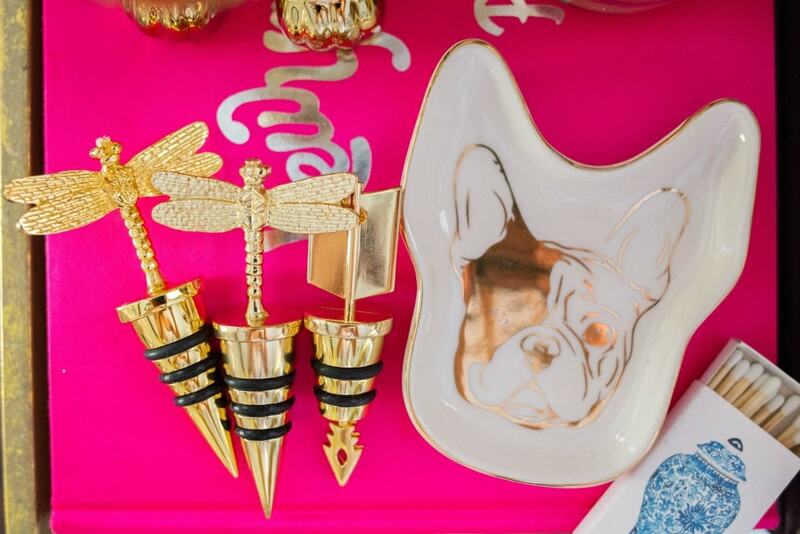 I have shopped jewelry and clothing before at Charming Charlie’s .. but didn’t realize that had such cute decor pieces! 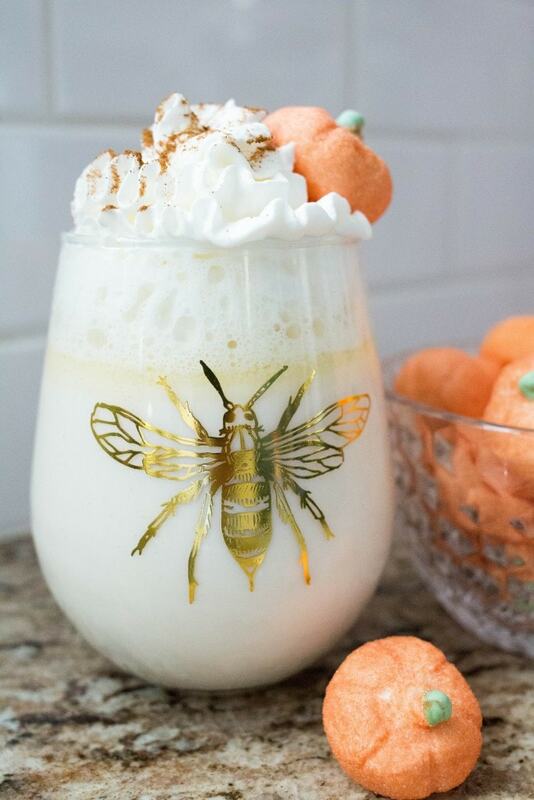 I also love your pumpkin spice white hot chocolate recipe!! It will be raining here all weekend so I’m thinking I’ll try it then! Let’s talk more about your pants! I love them. This hot chocolate recipe has me hoping for cooler weather soon ☺️. I’m not the best in the kitchen, so does the milk to creamer ratio matter? 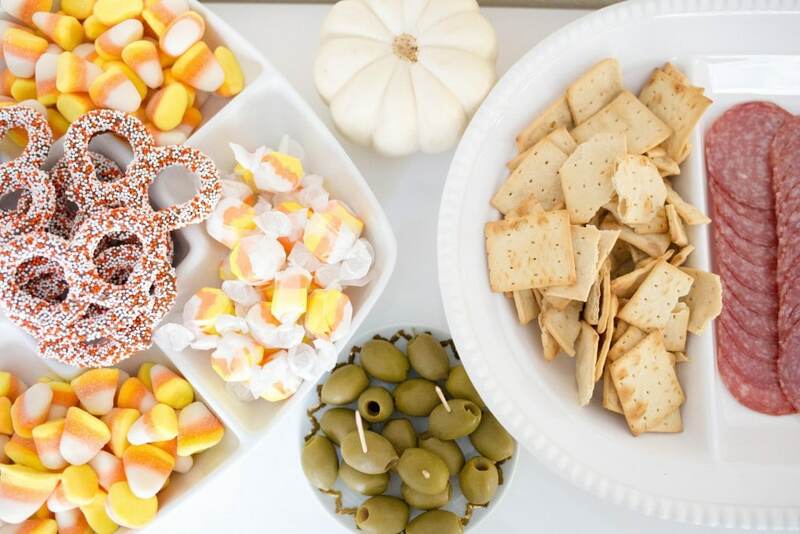 Where is the platter from with the cheese and crackers? Not sure, it was a wedding gift! Hey girl! 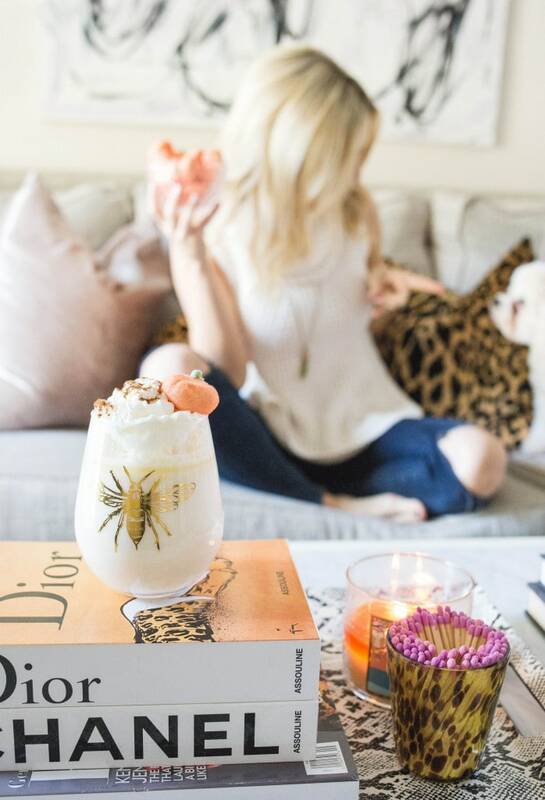 Is there a link for that pumpkin spice white hot chocolate recipe? I feel like I’d do a terrible job with proportions. Thanks!! It’s just a gallon of milk, a bag of white chocolate chips and as much or as little of the bottle of creamer as you want! I use about half to a full bottle! 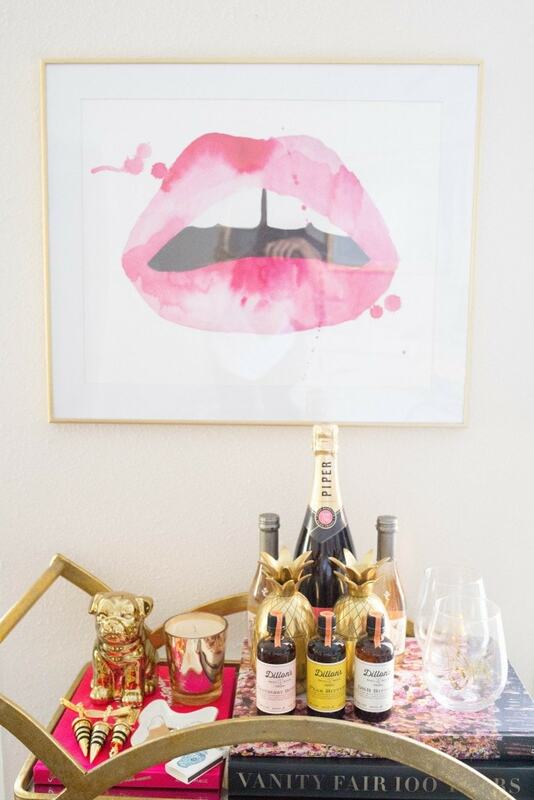 Obsessed with your bar cart! You always do such a great job of paying attention to all of the details! Love it! 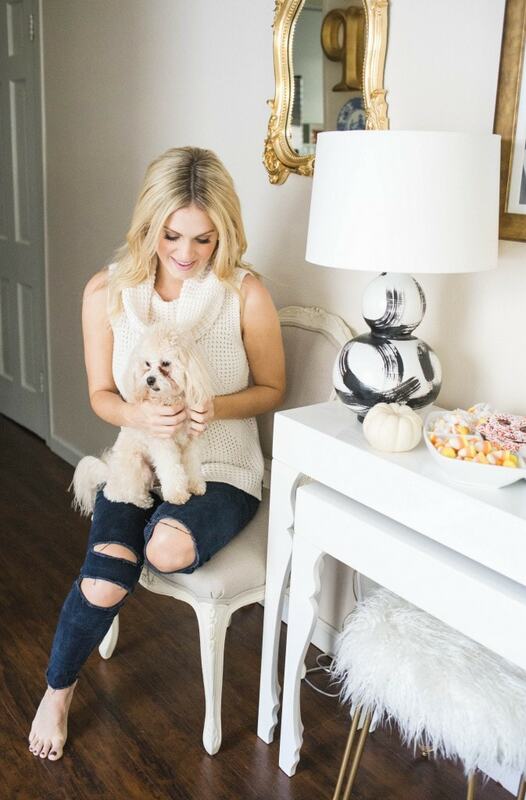 Obsessed with your cart and equally obsessed with that sweater! It’s beyond perfect for this “fall” weather in Texas haha! Thanks for always sharing such fun tips! I had no idea CC had items other than jewelry! We have a store in Norman but I never get down there (enemy territory for cowboy fans, lol). I love the last shot, peaches is trying to get some sweet treats! 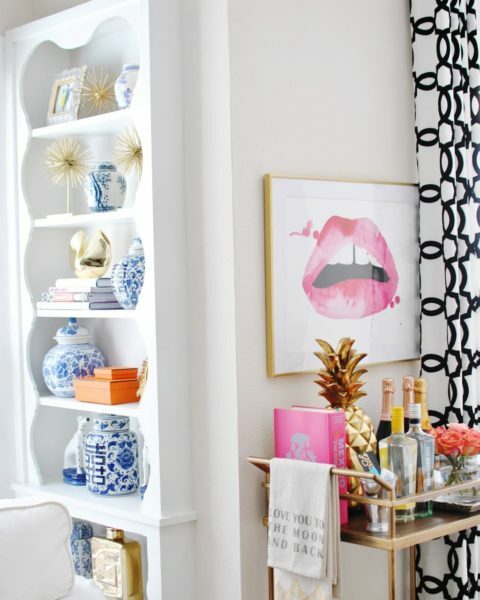 I have been on the hunt for a bar cart–I just need to do it and stop being so picky. I love how you mix things up for the seasons. I do the same thing on my mantel and with wreaths. You are right, it’s way too expensive to decorate the whole house with the seasons. Where is the tortoise cup from? With the matches? YUM! The pumpkin spice hot chocolate sounds absolutely amazing. Thank you so much for reading! It is listed on my home tour, I hope that helps you!! This is so cute! 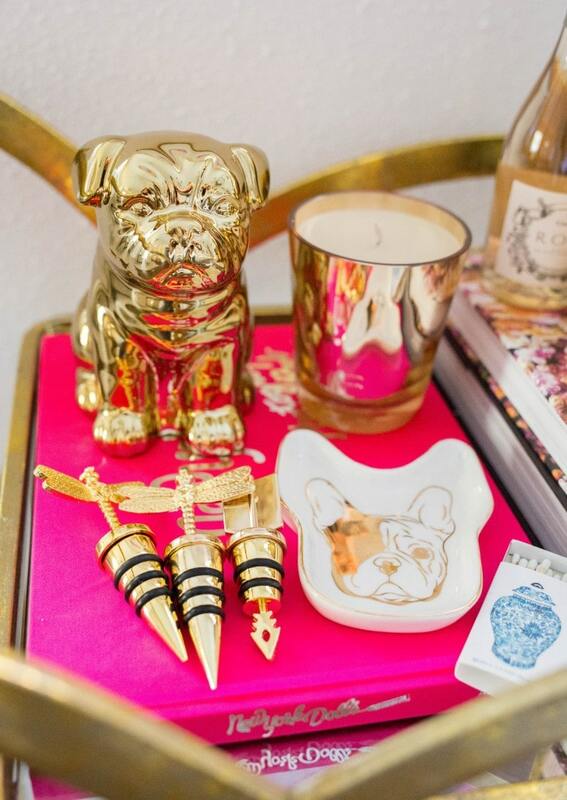 I have to ask: where did you get that gold bulldog? It’s adorable!! I’m a UGA alumn and I collect Bulldogs. I have a silver one I found at TJ Maxx that I keep on my desk at work.